I only use it when I am watching tv with my wife so I dont drive her completely crazy. .
Sure, it'd be interesting to see. Does that thing screw up the tuning/intonation? There was a similar thread sometime back and at that time I used a spare bridge and put a duct tape on the bottom and over the top. It deadened the volume some. And today, I tried something else. I was thinking about what Jay said, muting the strings with the karate side of the palm. What could you use to come up with a similar result? I thought I had an aha moment when I remembered soft silicone ear plugs. Went to the drug store and got them. Put 2-3 together and made a thick noodle that went over the bridge. Then a couple of pieces for each end of the bridge. 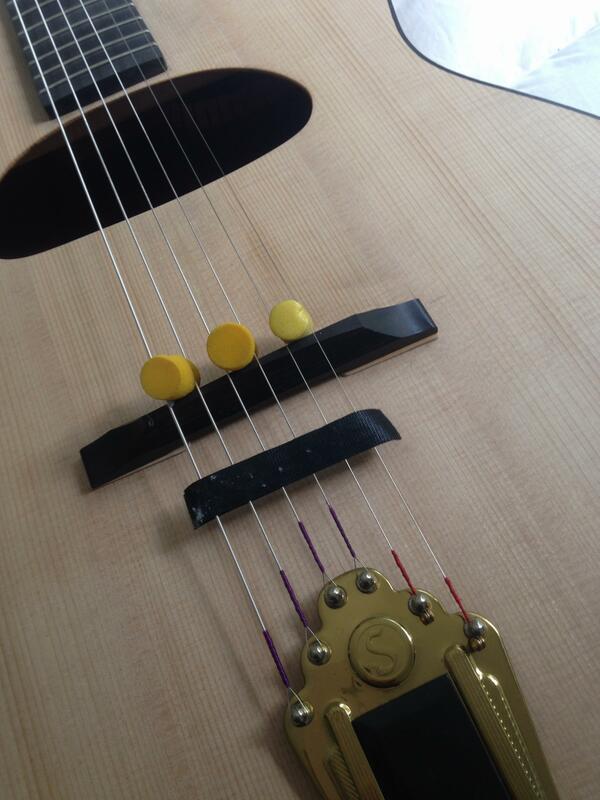 And a few more noodles around a soundhole. Tried it and it worked great, very muted sound. Then I went to take it off and realized this was a good idea but very dumb as far as material used. Everything started to get goopy. Fretboard cleaner lemon oil did a trick followed by a guitar polish and after 15-20 minutes everything was good and clean. But then I thought of what I should've in the first place, the poster putty. I use it to attach a Krivo pickup and never had any issue with a cleanup, comes off almost in one piece and it's very easy to pick up the rest. So I ordered some more. Will report back in a few days. Well....i tried to find my decibel meter tonight but I could not find it. Once I figure out where it is, I will run the test. Fellas, you appear to have gone off the deep end. A little bit of rolled up cloth—eye glass cleaning felt—will do the trick. No muss, no fuss, no goop! As to how loud it is after muting, not sure what difference it makes. There’s still going to be a percussive pic click, if nothing else. If you can still hear the muted note, then surely anyone else in the room can too. Those of you with wives that tolerate this while watching TV are lucky; or, you must have the thing on really loud. If you’re using this method to strengthen or train your left hand, I can see the point. But if you want to practice some more forceful right hand work in concert with the left hand—which is what it’s all about, really—it’s going to be heard, almost no matter what you do. Besides, I think you need that auditory feedback to progress effectively. You got smile and chuckle from me, though, Buco. Don’t think I ever could have imagined how anyone could have ended up with melting plastic earplugs on the top of a guitar. Some of the time I play my Gretsch and being a semi acoustic the hand muting on top of a quiet acoustic sound is not really noticeable. Other times I sue my Dunn and play quietly. As a believer in dynamics I find it takes more control and effort to play well very quietly than play loud, particularly with tremolo chords. Buco, how about some of the squishy foam ear plugs (or small bits of foam rubber) in between the strings right next to the bridge? Yeah don't use silicone. Use the foam rubber ones.